Some things just make you happy and one of those things, right up near the top of the gardening happiness list along with blue skies, butterflies and birdsong has to be when seeds start to germinate. Nothing is as tantalizingly hopeful as emerging fresh green shoots from the potting compost on a warm April day. 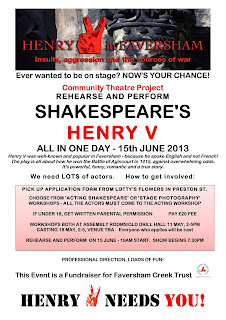 The Faversham Creek Trust is inviting people across Faversham and beyond to participate in a ‘Shakespeare-in-a-day’ production of Henry V.
Henry V in Faversham is a fundraising event for the Trust, which hopes to raise £1500-£2000, and involve lots of local people, either as cast, crew or helping out in some other way. Daringly, they will do the whole thing - rehearse and perform - in one day, Saturday, June 15th. The script will be abridged, running at sixty minutes and the performance will take place at The Assembly Rooms (Drill Hall) in Faversham. They are recruiting a full technical crew as well as the cast, and no previous experience is necessary. If you've dreamed of working in the theatre, this is your chance, as everyone attending the workshops and auditions will take part. A donation of £20 (students £8) is required to confirm your involvement, with various benefits in return for your contribution: acting or photography workshops, reduced price tickets for family or friends, photographs of yourself on stage, references or other recognition as appropriate, and of course, the fun and learning involved in delivering the event. There will also be an extra activity immediately following the performance, a talk on Henry V by local author Stewart Ross. If you'd like to take part in this production, either as a cast member, backstage crew or front of house assistants, please pick up an application form from Lotty’s Flowers in Preston Street. The 'Acting Shakespeare' and 'Stage Photography' Workshops will be held on May 11th, followed one week later (the 18th) by the Auditions and Casting Day. Then everyone will meet four weeks later to rehearse and perform the play. 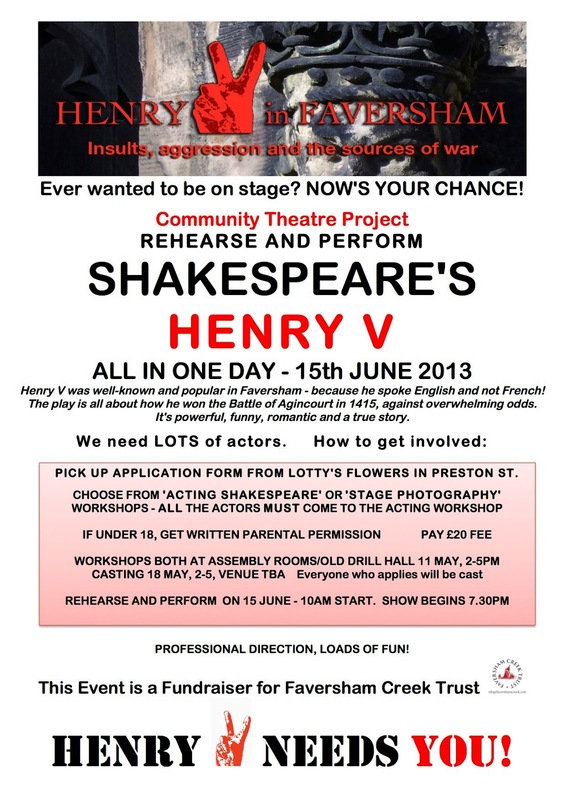 Full details can be found at http://henryvinfaversham.blogspot.co.uk/ Find us on Twitter @HenryVFaversham and search Henry V in Faversham on Facebook. Henry V had close ties with the town of Faversham. As a stopping point on the road from London to the coast, where his journeys to France began, Henry V often stayed at the MaisonDieu in Ospringe. On his final return journey, his body was laid to rest there before making its way back to London.